Night’s Watch secured a place in the 2018 Caulfield Cup with a fast-finishing win in the Naturalism Stakes at Caulfield this afternoon. 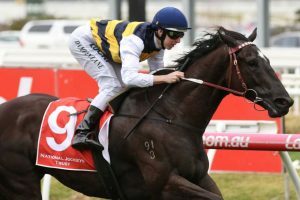 There was plenty of money for Night’s Watch in the lead-up to the Naturalism Stakes, but it wasn’t the easiest watch for punters that backed the short-priced favourite. Night’s Watch missed the start and was forced to settle in the second half of the field before jockey Damian Lane elected to take him to the extreme outside at the top of the straight. It took Night’s Watch a while to wind up and both Rising Red and Odeon were dangers inside the final 100 metres, but he kept finding the line to steal victory in the shadows of the post. Lane revealed after the race that Night’s Watch wasn’t entirely comfortable getting around Caulfield, but still did enough to get the job done. “He’s a really good horse, he missed the start again today which I suppose is something we’re going to have to work on,” Lane said. Trainer Darren Weir admitted that he though Night’s Watch may have been beaten and he was delighted to see the OTI-owned import get the photo finish. “Bit breathtaking their late, but he’s got the bob right,” Weir said. “Unfortunately he just didn’t begin well, and he just gets back a bit further than you would’ve hoped, but I guess they ran a quick furlong there which might have softened them up a bit late. Night’s Watch is currently $9 in the 2018 Caulfield Cup betting market with [ladbrokes]!